-When your computer can't open a file, it displays a dialog box and asks you what program you wish to open the file with. 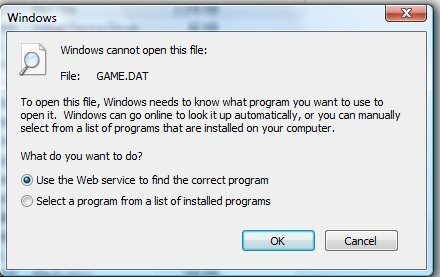 -You can try using a web service to find the correct program or selecting a program to run the file from a list of installed programs. However, I would recommend looking up the file's extension on a search engine and seeing if there is a website that will explain what the file extension is so that you can search for a program that will know what to do with that particular file extension. Also, a lot of files that people usually have difficulty opening are compressed files such as RAR files, which are archive files which you can open and extract with the commercial Win-Rar program or free Al-Zip program. -Please note: Don't just attempt to open any file you find on your computer. Some files are not meant to be opened, but just stored on your computer, so that they can be used for other things, such as storing certain pieces of information, running certain parts of one big program, running only at certain times, etc. Please know what the file is, where you got it from, and why you really need to open it before attempting to access the file. -If you got the file in an email or from a friend, tell them to give you the file in a more universal format by saving it in a more universal format. For instance, if they saved it as a .txt file instead of a .wpd file, that would probably be a lot more helpful to you as you might not have Word Perfect installed on your computer. To save a file in a more universal format in virtually any program, go to File, Save As, Save As Type, and then select a more universal format to save the file as. The more universal file formats are files with the extensions: txt, png, jpg, gif, pdf, rtf, html, mp3, exe, reg, shtml, wav, wmv, and others (refer to "File Formats" article coming soon). -If you are still having troubles, download and install all the programs and codecs on this Download Squad webpage. This should allow you to open most file extensions and prevent your exposure to the "Windows cannot open this file" dialog box.